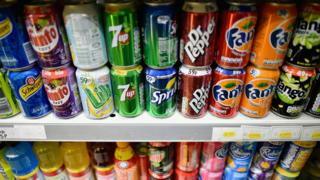 The NHS in England is asking staff and the public about whether it should ban or impose a tax on any sugary drinks sold in hospitals. Chief executive Simon Stevens says he wants the NHS to set a healthy example and "practise what we preach". He says trials at four NHS hospitals show either option could work. If the plan goes ahead, England would be the first country in the world to take such action. The consultation runs until 18 January. Subject to consultation, the drinks affected would be any with added sugar, including fruit juices, sweetened milk-based drinks and sweetened coffees. It is expected that a 20% tax on sugary drinks could raise £20m-£40m a year, for example. Proceeds would be ploughed back into patient charities and "health and wellbeing programmes" to keep the NHS's 1.3 million employees fit. During recent trials, one hospital that banned sugary drinks found the overall total number of drinks sold did not decrease, meaning vendors were financially unaffected. Mr Stevens said: "Confronted by rising obesity, type 2 diabetes and child dental decay, it's time for the NHS to practise what we preach. "By ploughing the proceeds of any vendor fees back into staff health and patient charities these proposals are a genuine win-win opportunity to both improve health and cut future illness cost burdens for the NHS." Health charities welcomed the idea, unlike the soft drinks industry. Gavin Partington, of the British Soft Drinks Association, said: "It's hard to see how a ban on soft drinks can be justified given that the sector has led the way in reducing consumers' sugar intake - down by over 17% since 2012. "In 2015 we also became the only category to set a calorie reduction target of 20% by 2020. "Given that the government is looking to introduce a soft drinks tax in 2018 it seems slightly odd that another public body wishes to duplicate this process." What is the UK's most sugary drink?